EDINBURG — Martin Knell Jr. said he would often find packets of cash taped or stapled to the drawers of the guest bedroom dresser when visiting his parents’ McAllen home. He once heard his mother moving the fake fireplace, another favorite hiding place for cash. The thousands of dollars in the house, which the prosecution alleges amounted to approximately $75,000, became a point of contention Tuesday in the Monica Melissa Patterson capital murder trial when Knell Jr., the only child of the 96-year-old victim in the case, took the stand. The soft-spoken 67-year-old took his time during a daylong testimony on the witness stand, offering glimpses of emotion as prosecutors asked him to identify family photos showing four generations of the Knells. Outside the presence of the jury, who were asked to leave the courtroom so the prosecution and defense could take up a legal matter with District Court Judge Noe Gonzalez, Assistant Criminal District Attorney Joseph Orendain made his case for why a document should be submitted as evidence for jurors to consider. Patterson, 50, is alleged to have killed Martin Knell Sr. in January 2015 in order to take control of his large estate. Over the course of nearly four months, Patterson and Knell Sr. went from being complete strangers to Patterson being named as beneficiary of his will and payee upon death on his bank accounts. Orendain argued that a photograph of what he described as a map of where the money was located in the home, referred to as state’s exhibit 168, should be allowed in the district attorney’s case against Patterson. Exhibit 168 was recovered during a search warrant of Knell Sr.’s Chase Bank safe-deposit box. Last week, jurors were presented with security camera footage of Patterson and Knell entering Chase Bank’s privacy room to look through his safe-deposit box. The privacy room is an area closed to bank staff and not under surveillance. Knell Sr.’s wife, Thelma, is believed to have made the map, which was not visible to those in the courtroom gallery on Thursday. Those in the gallery included attorneys, members of the media and of Knell Sr.’s family, in addition to a handful of people who identified themselves as spectators. Gonzalez questioned the prosecution as to the relevance of the document. 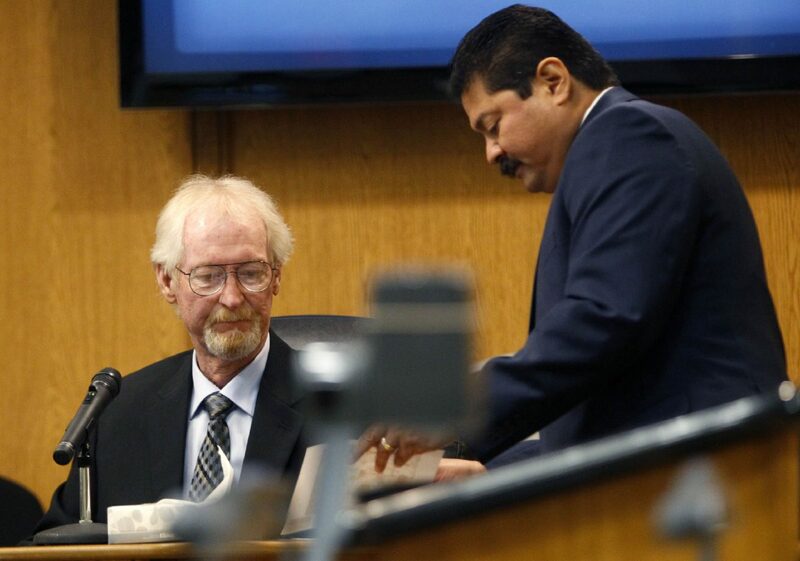 Ricardo “Rick” Salinas, one of Patterson’s four attorneys, countered that the prosecution couldn’t prove whether there was ever any evidence that Patterson saw the document. 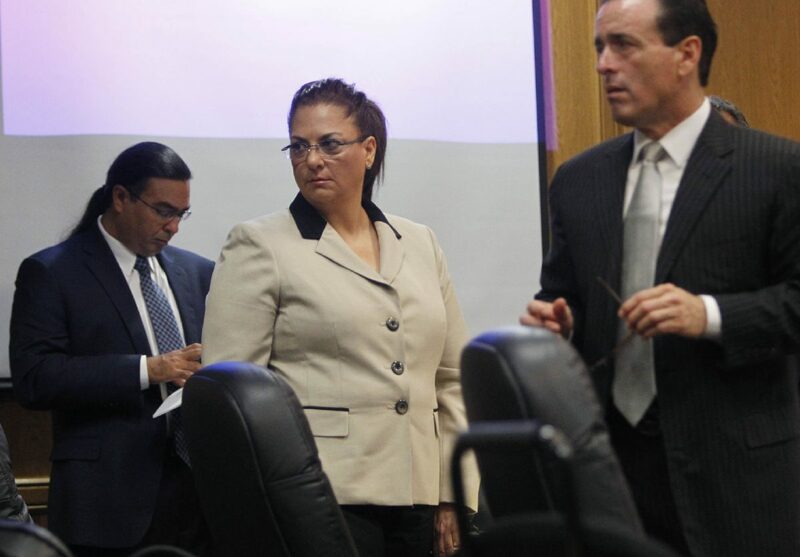 “It’s never been contended, that I’m aware of, that she took money from the home,” Gonzalez interjected. He went on to explain that the state plans to argue that $75,000 from behind the fireplace is missing in addition to the $400,000 in cash that Knell withdrew from Chase Bank over the course of a two-week period. The state alleges Patterson locked Knell Jr. out of the house following his father’s death. Orendain responded that it was “forfeiture by wrongdoing” since Thelma died in October 2014 and Knell Sr. was subsequently murdered three months later. “She’s killed the only other witness left to authenticate that document,” Orendain said with notable exasperation. He argued Knell Jr. could authenticate his mother’s handwriting on the document. Gonzalez ultimately ruled, after more than 20 minutes of exchange, that he could not have the document “admitted in front of the jury” until he did more research on the matter. The defense will cross-examine Knell Jr. on Wednesday.